A highly effective moisturizer that delivers all day hydration to leave the skin feeling supple, smooth and fresh. 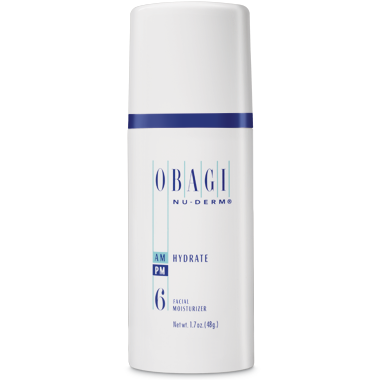 The Obagi Hydrate Moisturizer is a highly effective moisturizer that delivers all day hydration to leave the skin feeling supple, smooth and fresh without any added irritation. The Hydrate Moisturizer contains ingredient Hydromanil that boosts moisture in the skin and also provides a time-released effect that gradually helps hydrate the skin cells. Other natural ingredients such as avocado oil, and shea butter help to leave the skin feeling soft and smooth to the touch allowing for a visibly brighter and even skin complexion. The Obagi Hydrate Moisturizer can be used with any and all skin types, as the delicate formula is lightweight and delicate on the skin. Including Hydrate Moisturizer into a daily skin care regiment will help prevent dryness of the skin as well as give protection against harmful free radicals in the environment that can cause skin surface damage. For best results, use in conjunction with other Nu-Derm products, but can be a stand alone for added hydration any time of the day.